The old town of Caceres is renowned for its well-preserved 12th century Arab city walls (notably the Torre Mochada and Torre del Bujaco). Caceres was recaptured from the Moors in 1229. New groups of settlers were attracted, which led to rivalling factions constructing their houses, palaces and towers in their own styles. The city's architecture now is a blend of Roman, Islamic, Northern Gothic and Italian Renaissance styles. Modern Caceres is a sprawling and bustling city with about 90.000 inhabitants. You cannot even see the towers of the Old Town from the access roads, as it's all very built up. No trouble parking though, for a mere 1 Euro-cent per minute I had a spot in a parking garage very close to the center. A few narrow streets and you're at the Plaza Mayor, where you'll get the first view of the magnificent gates, walls and towers of Caceres. The Torre del Bujaco is the most prominent one. You can climb it, and get a good overview over the historic centre. And have a good look at the numerous storks. They clearly like all those towers for nesting! The Old Town is very compact and a pleasure to navigate on foot. It holds historic buildings very similar in style and colouring. It has a museumish atmosphere, because only at the fringes there are houses where people actually live in. At one of the little plazas a folk music & dance group was performing, entertaining the numerous day trippers around. I ended my tour on a terrace in the sun, an appropriate ending to a pleasant afternoon spent in Old Caceres. Cáceres is one of many WH-listed towns on the Iberian peninsula, and because of its somewhat remote location, it's one of the less visited ones. I enjoyed my stay there, and it's really very pleasant to walk through the narrow alleys and admire the many historic buildings, or to sit down on the Plaza Mayor (just outside the Old Town) and do some tapa-eating and people-watching (a bit similar to Salamanca, just much smaller). There are, however, no outstanding individual attractions, so the charm of Cáceres is more in its almost unchanged medieval ensemble rather than in any one building. If an individual building should be mentioned, then it is probably the Torre del Bujaco, a 12th-century watchtower worth climbing for its views of the Old Town on one side and the Plaza Mayor on the other. 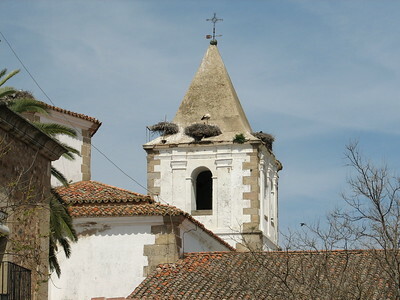 Also, Cáceres is a good base from which to explore the many sights of Extremadura (especially Mérida, Trujillo and the Guadalupe Monastery), which is still relatively unknown to non-Spaniards. I visited this WHS in August 2014. I spent 1 night here in a hotel overlooking the central Plaza Mayor. The different styles of architecture are immediately visible from there (picture). Unfortunately in August there were no storks to be seen although I could see their nests everywhere but I was extra lucky to spot a domestic peacock walking freely on one of the tower walls! The historic centre is full of towers some of which are open to the public. The episcopal palace and church are worth visiting as well as the Puerta Merida and Jewish Quarter. The highlight of my visit was wandering about the narrow roads and alleys early in the morning, where I was lucky enough to see some "peregrinos" on there way to Santiago de Compostela and where I met a 94 year old priest who kindly gave me a detailed overview of the history of Caceres over time. I won't count my visit to Caceres and other sites I visited around Spain (such as nearby Burgos, San Millan de la Cogolla, Salamanca, etc.) as a valid visit to the Route of Santiago de Compostela in Spain as I intend to do the real thing next year when I embark on the Camino from France to Santiago. From opposite Caceres station I took bus # L1 to the Plaza Major and entered the compact old town through the Arch of the Stars. While this entrance and the old walls and towers are in a good state of repair the buildings are really nothing special compared to Salamanca or Segovia. Fiestas must be a regular feature here because one was in progress in the Plaza Las Valetas during my visit. Dear friends!We love this town. We got there in Easter a couple of years ago by bike coming from Salamanca and we were surprised not only because of the monuments but for the processions... We live in Spain, but it was the first time we saw it! I hope you need to come to Spain to visit more World Heritage Sites, so we can offer you our home. Un abrazo!! This world heritage site is very special to me as I was born here. If you visit old town in Caceres you'll feel as if you're back in the Middle Age. Quiet town (but with well-known nightlife), lovely people, well worth a visit. I visited this city twice. Is is one of my favorite places in Spain. The city walls surround several nice palaces. Caution, during the summer the temperature may be above 40 oC. Roger & Veronica Elliott . We visited in 1997 stayed at Hotel Iberia and had a wonderful time beautiful town lovely people. Cisterns: "the five-nave reservoir with three bays, incorporated into the Casa de las Veletas in the 16th century"
Moctezuma Family: Palacio de los Toledo-Moctezuma, built by Juan Cano de Saavedra thanks to a large donation from his wife Isabel, daughter of the Aztec ruler Moctezuma II.